With the Oscar season hotting up, Ster-Kinekor has scheduled to premiere quite a number of nominated films between now and the award ceremony on the 4th March 2018. One film that has been getting quite a lot of buzz of late is Three Billboards Outside Ebbing, Missouri. Don’t let the title fool you, this movie is anything but dreary, and there’s a lot to process during its 115 minutes run-time. 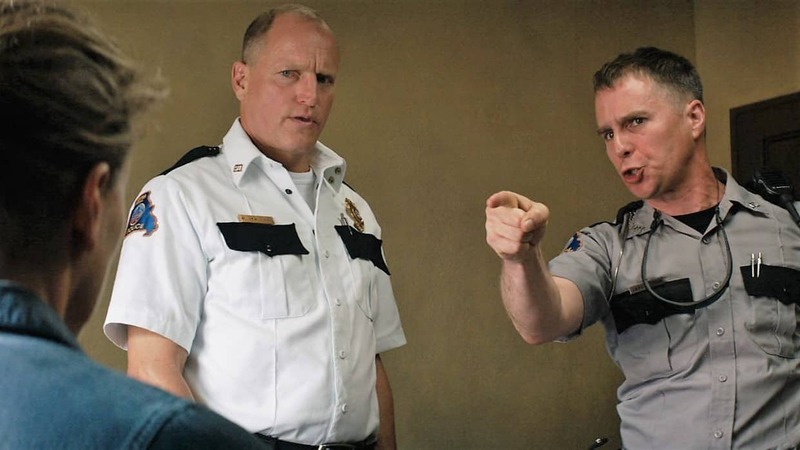 The movie features a number of great performances from the likes of Woody Woody Harrelson as police chief Willoughby, Sam Rockwell as officer Dixon, and Caleb Landry Jones as advertising mogul, Red Welby. But none of their performances are as rounded and raw as Frances McDormand who plays Mildred, a grieving divorcee, whose daughter was brutally raped and killed. With the case nowhere near being solved, Mildred becomes increasingly frustrated. As the name suggests, the events that unfold in the film are set in motion (after the murder) by the hiring of three billboards on the outskirts of Ebbing, Missouri. Mildred uses these large signs to spark controversy in the town, with fierce words directed at Willoughby. Three Billboards Outside Ebbing, Missouri isn’t all doom and gloom as you’ll often find in dramas relating to the same subject matter, but a rather plucky tale of revenge, violence, forgiveness and courage. While there are moments of sheer emotion and distress due to the nature of the murder, along with a few other character journeys, the tension is broken fairly frequently by the main antagonist herself. To put this roller-coaster ride of emotion into perspective, there was one particular scene that almost broke me. I was doing my best to force that teardrop from leaving my eye sockets when a few moments later I’m in stitches for some of the crazy antics from one of the characters. McDormand wears her character’s emotional distress on her sleeve. Her sorrow and torment are written all over her face in every scene. Mildred’s lack of respect for any person in her way, at this point in her life after the said events, provides a glimmer into the state of being a parent may undertake after losing a child. This is most notably displayed when a pastor visits her, hoping to tactfully request her to take the billboards down, only to be met with wrath and fury. Many of Three Billboards Outside Ebbing, Missouri‘s best moments are down to how well the actors’ gel, with their portrayals fresh and real. Director, Martin McDonagh, created something unique with the cast, making you question almost all of your reactions to each of the events unfolding. Given the full portrayal of characters and their journey throughout, it’s clear to see that there aren’t any overwhelmingly good or bad guys here. Each person has their own issues to deal with, even with the huge overhanging cloud in the small town caused by the gruesome murder. Even characters you may out-rightly dislike at the start not only grow on you but you’ll end up rooting for at curtain call. Three Billboards Outside Ebbing, Missouri is definitely worth the watch for all movie-goers (minding the age restrictions), and I highly recommend it.